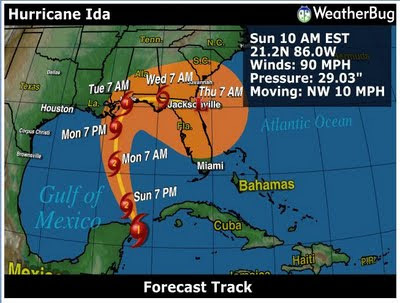 Karsun Designs: Aren't you a little late, Ida? This is the view earlier today. Seems we have a little hurricane headed this way. Right now it looks like it's going to the Mobile, AL area and hooking over although earlier it was hooking much lower, which would have it pass through us. It's a category 2 so it's not a biggie. Probably just get some wind and rain. It's just so late in the season that it's pretty surprising.